I’ve been buying rotisserie chickens a lot lately, but have grown tired of them. With today’s nice weather, I decided to buy chicken to cook myself on the grill. 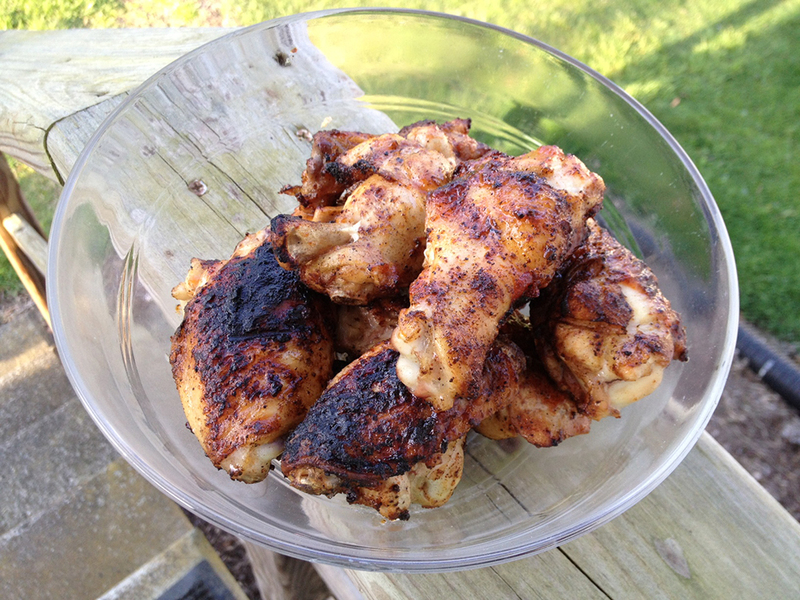 I settled on this recipe for barbecue chicken. I made the sauce per the recipe, but did everything else differently. I bought a bone-in chicken breast at the Amish market, which I had them split for me. I also bought 1.5 pounds of wings. 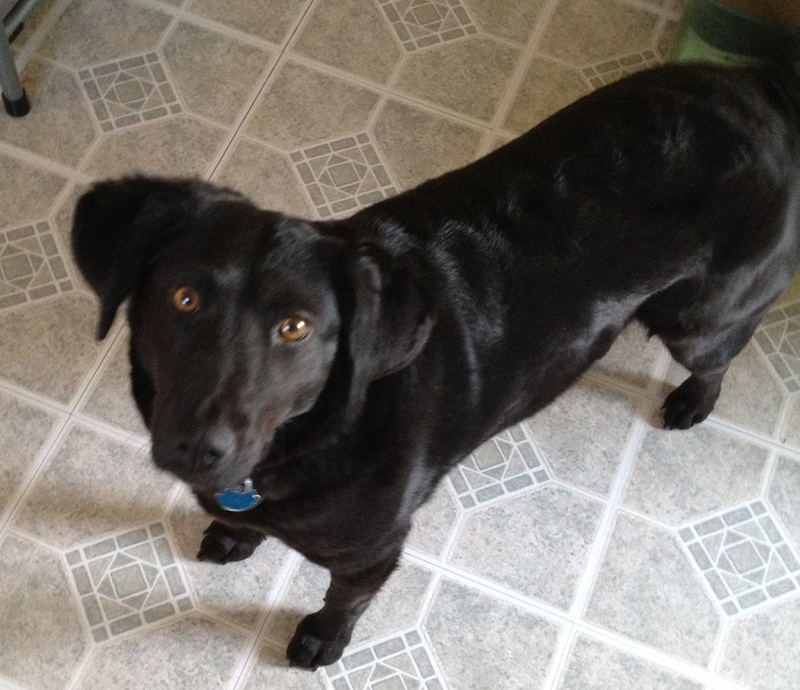 Maggie was very attentive during the whole grilling process. I sprinkled the meat with a seasoning mix from Penzey’s and grilled them per this recipe instead of the indirect heat suggested in the recipe above. I brushed half of the sauce over the meat towards the end of cooking it. I was glad I had bought the wings because they cooked much faster. I was able to enjoy them while I waited for the breasts to finish cooking. Those I’m saving for meals later this week. Here’s a photo of the wings before I demolished them. I removed the skins before eating them. The cinnamon bun was okay — it wasn’t everything I’d built up in my head. Wishing I had those calories back. The pound cake I had after dinner with a sauce I made out of frozen raspberries and fresh strawberries simmered together. I drizzled some chocolate vincotto (I keep forgetting I have this) over the whole shebang. That was really good. Thursday night, I picked up a small box from Eating Out of the Box. It contained lettuce, kale and two types of Chinese cabbage. Today, I used up the rest of my landscape fabric to cover the ground around my raspberry and blackberry canes, and under my Vegtrug. Fingers crossed this makes weed control in those areas easier this season. I’m not planning to mulch the entire area, though I may eventually mulch around the base of the berry bushes. I’m also hoping the barrier fabric really does allow moisture through, as promised. Otherwise, watering those berry plants is going to be a pain. I also planted some seeds I bought last summer at Monticello. The flowers are meant to attract butterflies. I sprinkled them in a bed by my garage where I threw down wildflower seed bombs last year. Some of those seeds and plants have returned this year. Hopefully the new seeds take too. Tomorrow, I’m hoping to plant some of my remaining vegetable seeds. I also need to devise a trellis system for the berry bushes and amend my compost mixture. Oh yeah. And mow the lawn. Posted in Cooking, Dessert, Dinner, Food, Freezer, Fruit, Gluten-Free, Local, Meat, Poultry, Recipes, Sustainability and tagged Amish, bison, carrots, chocolate, cooking, food, freezer, strawberries, sustainability. Bookmark the permalink. After my trip to the bison farm yesterday, I thawed a pound of the ground bison for tonight’s dinner. But I’m still not in the mood to grill burgers (too cold out) or make tacos (not eating tortillas at the moment). Then I had a brain wave. I haven’t made chili yet this season! It was already 2 p.m. when I had this thought, so I raced to get out my crockpot and start thawing some of the frozen ingredients. I’m not eating grains right now, so no rice or cornbread for this chili. 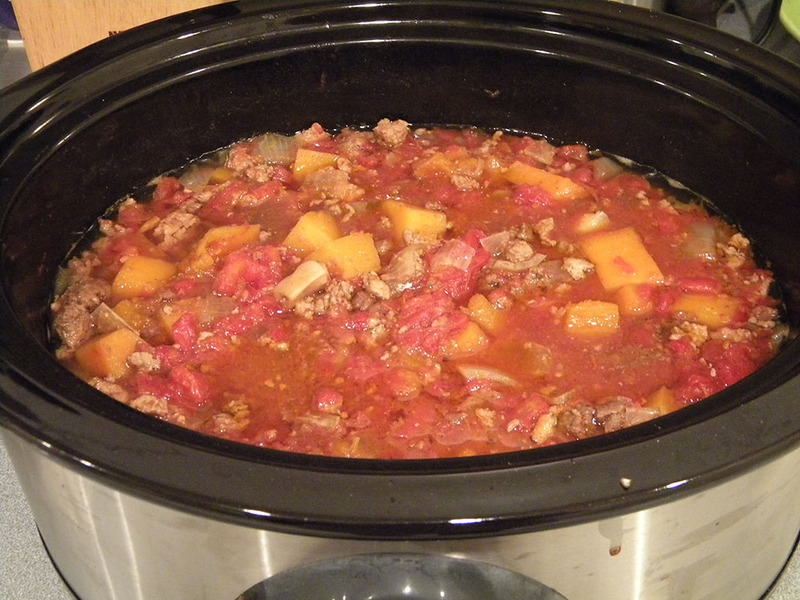 To make the chili hearty enough to eat on its own, I decided to add butternut squash to the pot. But the huge squash I had dwarfed the quart of tomatoes and pound of bison I started out with. 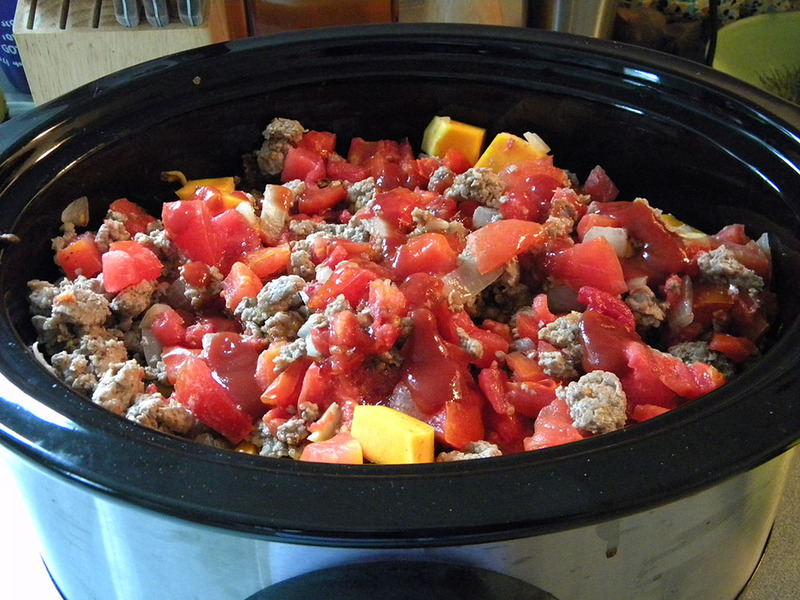 I ended up adding another quart of tomatoes and a pound of ground pork as well. The crockpot is filled to the brim as I type this! *My tomatoes held enough juice to give this chili a nice broth, but you could add beer, stock or water if needed. You also could add any number of things to the ingredient list above, like beans, etc. I tossed the frozen tomatoes into the crockpot unthawed and turned it up to high. While I had it working on the tomatoes, I browned the bison with half of the onion and then added that to the crockpot. Then I did the same with the remaining onion and ground pork. I added the squash to the pot and then the remaining ingredients (except the lime). I added a bit of Penzey’s 33rd & Galena spice mix to the pot as well as each meat mixture as it was browning. After a few hours on high, the chili was ready to eat! I squeezed a bit of lime juice over my first bowlful and it was quite tasty. It would be really good with some sharp cheddar grated on top. I’m letting the chili simmer for another hour on low before I cool it down for the night. Looking forward to taking leftovers to work for lunch this week! Posted in Cooking, Dinner, Food, Freezer, Local, Meat, Recipes, Sustainability, Vegetable and tagged bison, butternut squash, cooking, food, freezer, onions, peppers, sustainability, tomatoes. Bookmark the permalink. I ordered these from Gardener’s Supply Company. Fell for one of their emails hook, line and sinker. But how can growing my own garlic be bad? It can’t. And I like these bright blue bags. I didn’t order enough container soil from them, but I had extra of my own on hand. I did have to buy fertilizer to supplement the container soil that I did buy from them. They sent me two types of garlic — California Early and Chesnok Red. The latter will be ready for harvest (hopefully) by early summer and I had two full heads of that type. It’s a hardneck garlic with purple cloves. The other is a softneck variety and I only got one head of that type. It’s apparently the kind you often see braided. I can’t wait to try that myself. My other impulse buy was a food dehydrator. I’d been thinking of getting one of these for a while now. I realize the title of this blog is Freezer Full and I’m still committed to filling my freezer as full as possible with my own home-cooked goodies. However, as every severe storm reminds me, there is one huge flaw to relying on my freezer to store food — power loss would be catastrophic. Hours and hours of work gone and hundreds of dollars wasted. Meanwhile, I’d probably be hungry. 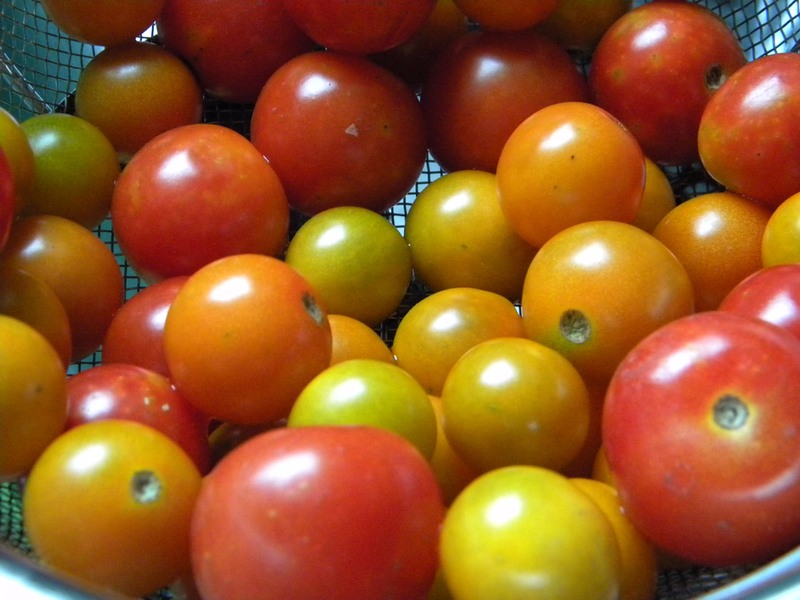 Dehydrating food is a better solution because the resulting stored foods are less likely to spoil. Never fear, however, as you’re supposed to refrigerate or freeze most dehydrated foods to extend their shelf life. Therefore, my freezer will continue to be full, even if I rely more and more on the dehydrator. 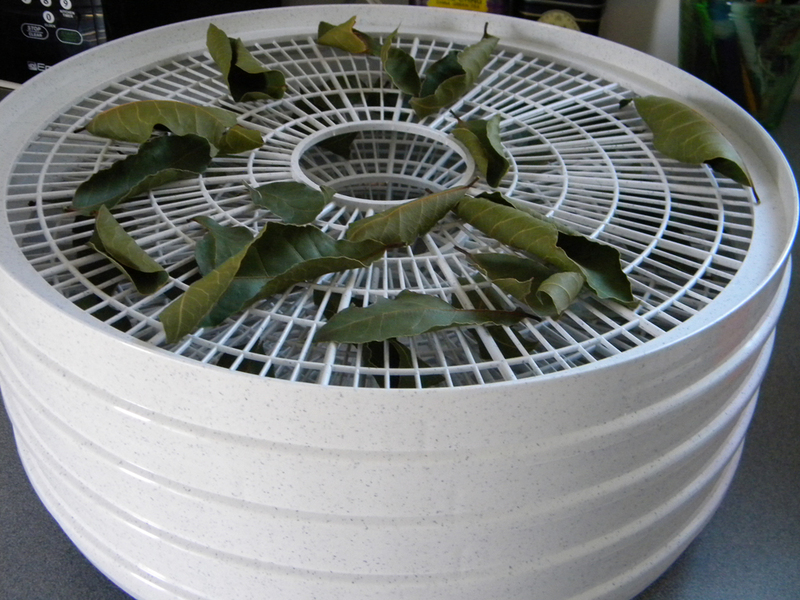 For my first dehydration experiment, I dried the fresh bay leaves I bought at the farmer’s market. I’m almost out of the bottled kind. My house smells so good right now. I never realized how good bay leaves smell! Shows what I’ve been missing by buying the store-bought kind. 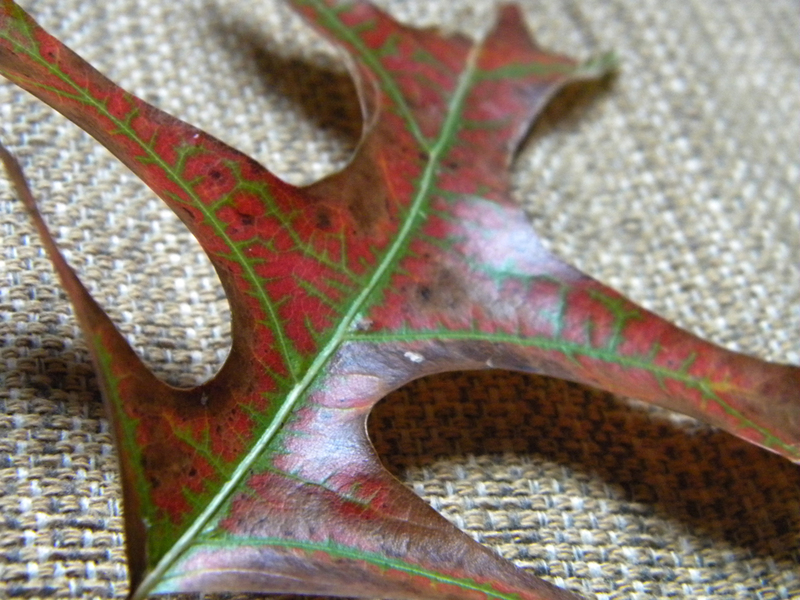 I may buy more fresh bay leaves next weekend just to put in a jar or something. 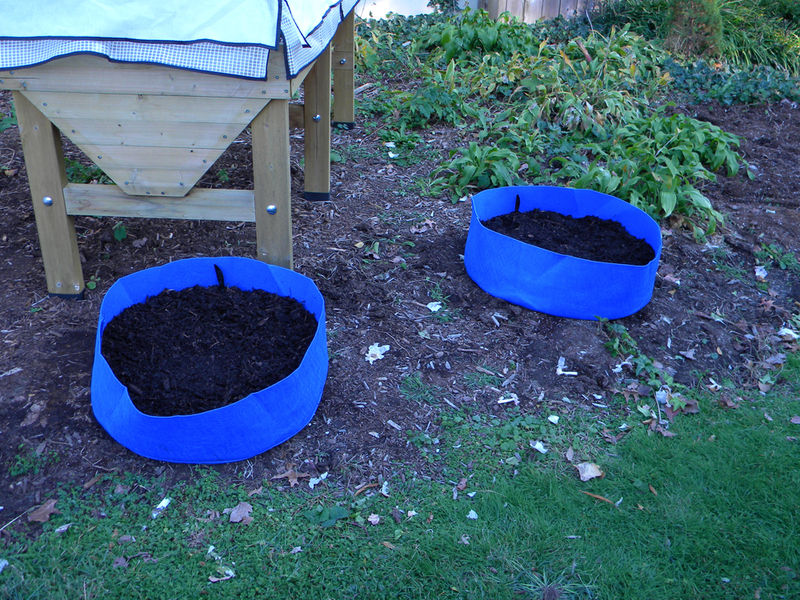 In addition to setting up the garlic grow bags, I put the winter coat back on the VegTrug — I put the greenhouse cover on and then put the other cover I have for it on top of that. This is in the hopes of staving off the inevitable first frost. My spinach plants aren’t dead, but they’re not thriving either. I’ll be lucky to get a side salad out of those. The kale seems to have slowed down. I might get a meal out of those plants. There are carrots left in the soil, the chives are still kicking and the rosemary doesn’t seem to care what’s going on — it just rolls with it. I had to dig out one of my hostas in the side yard to make room for the garlic grow bags, but I stopped short of removing the ones in the front yard yet. I did clear out some weeds out front and trimmed back the hydrangeas. I mowed the lawn yesterday, but some spots were too long for the rotary mower. Posted in Food, Freezer, Grow Your Own, Herbs, Local, Meat, Sustainability, Vegetable and tagged bay leaves, broccoli, food, freezer, gardening, kale, peppers, sausage, sustainability, tomatoes. Bookmark the permalink. I broke one of the cardinal rules of food shopping today and left for the markets before breakfast. The result: I bought a ton of food! What’s more, I haven’t even touched the watermelon and butternut squash that I bought last week. Also, the plums I bought last week were far from ripe and so those have been hanging out until they soften up a bit. I still have some of the peaches that I grilled to eat too. Oh, and after purchasing everything that I did today, I forgot to buy greens like I’d planned. *It didn’t occur to me, until there were only a few left, that maybe instead of eating the entire half-pint of raspberries in one sitting, I could have frozen them for baking or something later. This is the second time this week I’ve downed that many at one time. The farmer’s market at UMD had them this week too. In my defense, the ones I bought at work were so ripe, they wouldn’t have survived until I got home and I did share some with my coworkers. 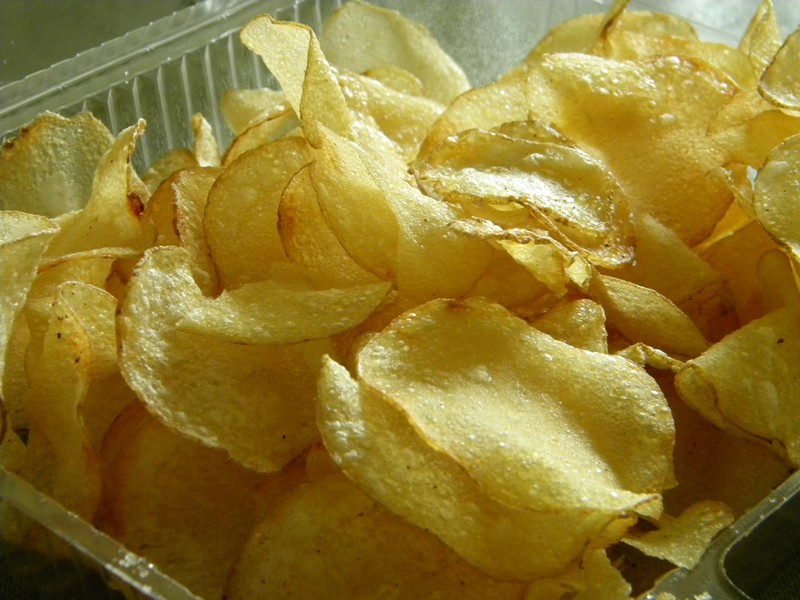 Amish hand-made potato chips (a.k.a., breakfast). It appears that wheat, and also probably gluten, are among my allergies. I’m still trying to figure out the gluten thing though. I can drink beer, but not wheat beer. I was able to eat non-wheat flour bread last weekend, but presumably it still had gluten in it? I did, happily, find flourless, eggless cookies at the UMD farmer’s market this past week. Definitely going to stock up on those! Not much to report from the garden. I still haven’t planted what I said I would. I had hoped to do some planting today, but now it’s raining. Hopefully, tomorrow. Posted in Breakfast, Cooking, Dairy, Dessert, Food, Freezer, Fruit, Local, Meat, Recipes, Seafood, Side, Snack, Sustainability, Vegetable and tagged Amish, beer, bison, blackberries, butternut squash, cookies, cooking, food, freezer, gardening, onions, peppers, salmon, sausage, sustainability, sweet potatoes, tomatoes. Bookmark the permalink. 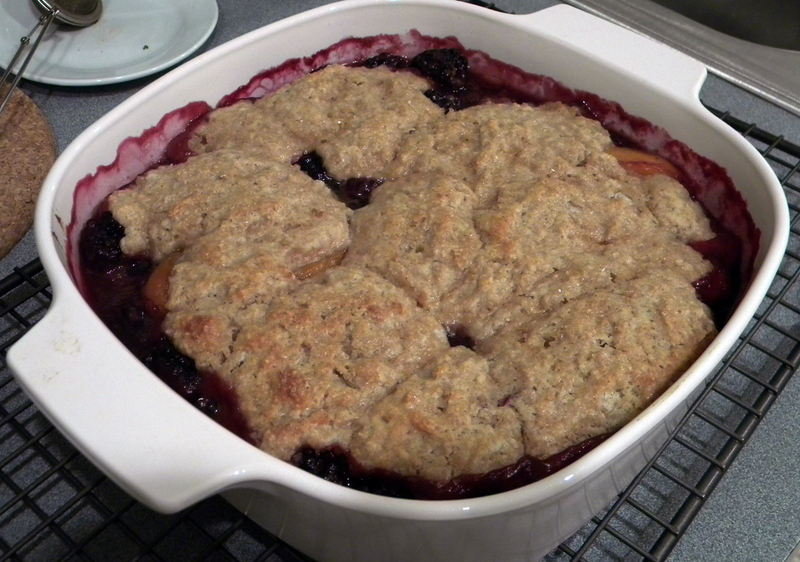 I made Honey Peach & Blackberry Cobbler to take to a dinner with friends last night. It turned out pretty well, considering I messed up in halving the recipe (too much sugar) and I didn’t have fresh lemon juice for the fruit. Luckily, I was using frozen peaches that I’d stored in a mixture of lemon juice and simple syrup, so they didn’t brown too much. I also used frozen blackberries from last summer. This was all part of my attempt to continue clearing out my freezer. I’m going to need to defrost it soon, before I start filling it up again from the (hopeful) bounty from my garden and what I buy at the farmer’s market. Speaking of the farmer’s market, here’s a fun video done by the Easton Star-Democrat about yesterday’s opening. This morning, I had fresh berries on my oatmeal for the first time since the last of the blackberries were available last summer. You really appreciate things like fresh berries a lot more when you only eat them in-season. I love this time of year! 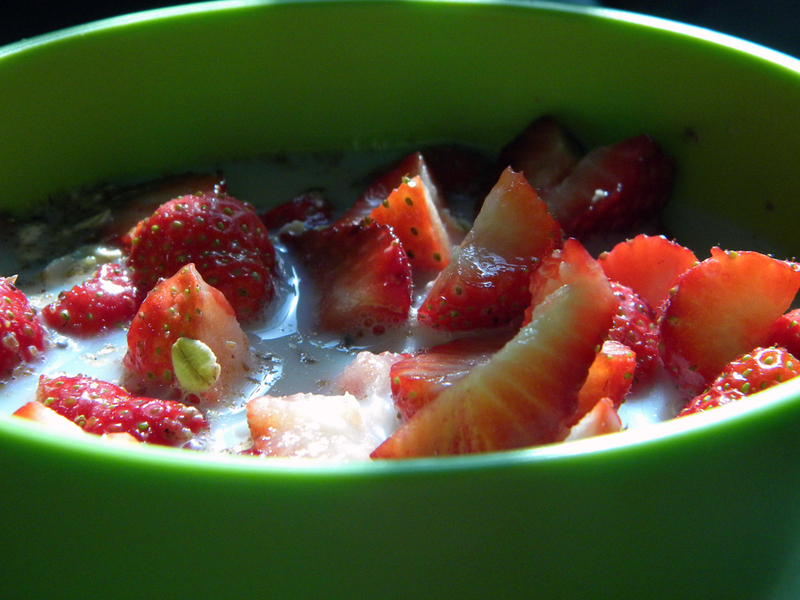 I like a little oatmeal with my strawberries. Posted in Baked Goods, Breakfast, Cooking, Dessert, Food, Freezer, Fruit, Local, Recipes, Sustainability and tagged blackberries, cobbler, cooking, food, freezer, peaches, strawberries. Bookmark the permalink. Now That’s What I Call Tea! 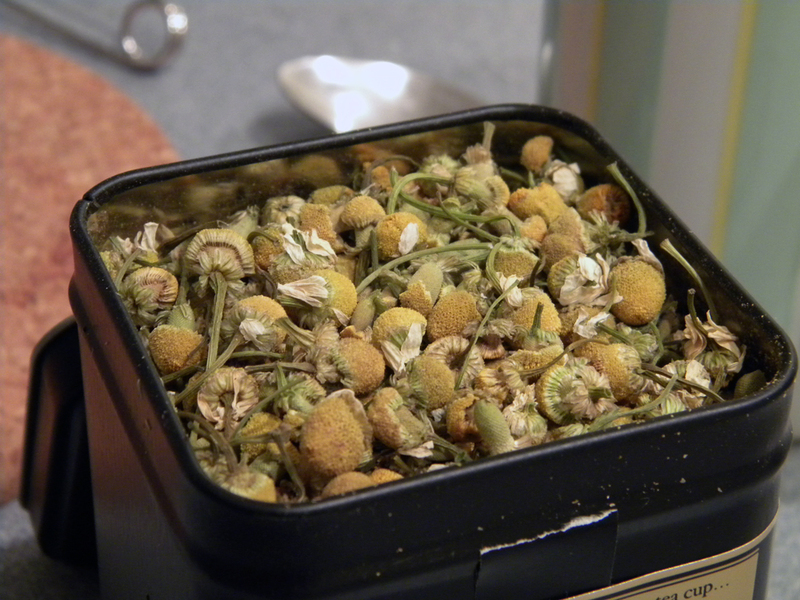 Just opened my first tin of Harney & Son’s Chamomile Tea. So pretty and it smells amazing! Now that's what I call tea! Report from the garden: The weather’s been kind of dreary this weekend, but the arugula seedlings are cropping up. I bought a bunch of seedling pots and other gardening paraphernalia at Target today. I’ve also plotted out the approximate placement of the plants in my Vegtrug, for when I’m ready to transplant them. Report from the stove: I’m trying to work through what’s in my freezer in preparation for filling it again when the farmer’s market re-opens in a few weeks. I made vegetable stock today (a portion of which will be donated to a friend’s matzo-ball soup) and used some of it in butternut squash soup. I’ve blogged about both before, so no new cooking posts this weekend. Posted in Beverage, Cooking, Food, Freezer, Grow Your Own, Soup and tagged butternut squash, cooking, food, freezer, gardening, tea. Bookmark the permalink. I was on the road yesterday and so didn’t get to the markets for any fresh food. 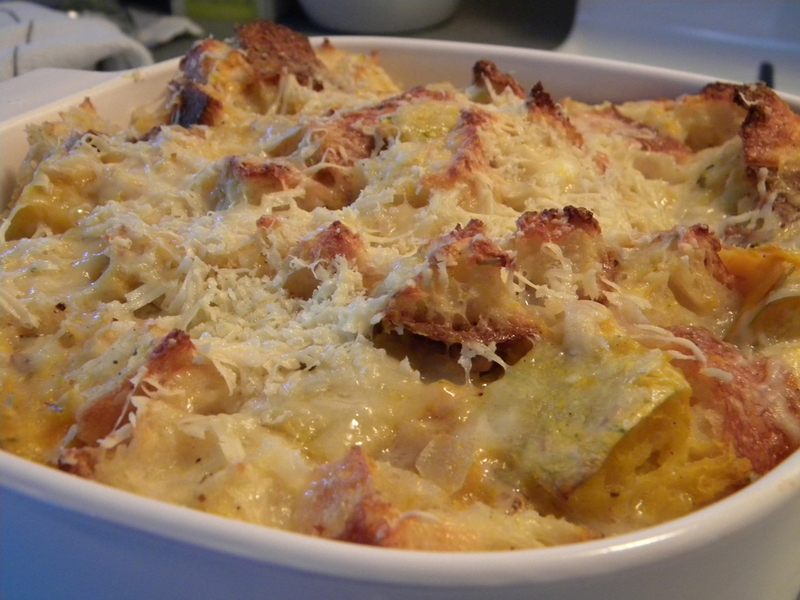 I tapped into my freezer stores to make some Butternut Squash and Parmesan Bread Pudding. I used already roasted and cubed squash and two sections of a frozen baguette. The reviews of the dish said it could be bland if cooked exactly according to the recipe. Some reviewers added meat to correct this problem and others added herbs. Based on the suggestions, I added a sprinkle of cayenne pepper, a pinch of rubbed sage, about 1/4 tsp. dried thyme and a generous pinch of dried rosemary. My house smelled heavenly as the pudding baked in the oven. 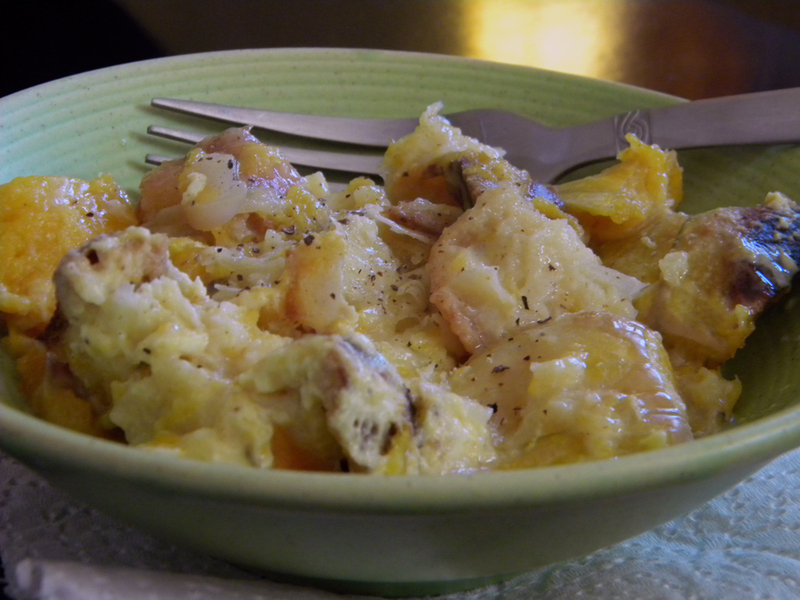 The results are quite tasty and it made quite a bit — at least 6 servings. The recipe suggests serving the bread pudding with kale or mustard greens. I had mine with wine. Posted in Cooking, Dinner, Food, Freezer, Local, Recipes and tagged bread pudding, butternut squash, eggs, food, freezer. Bookmark the permalink. Take Part | Food, Inc.